Instant Pot Mashed potatoes are very easy to make. They come out fluffy and delicious. You can make pressure cooker Mashed Potatoes in minutes! 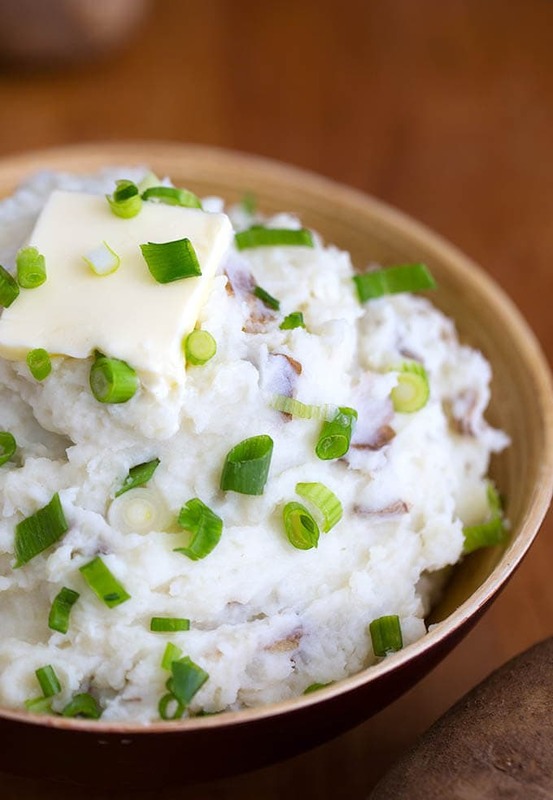 One of the most popular side dishes ever to grace an American dinner table is mashed potatoes! Right alongside the meatloaf! As easy as mashed potatoes are to make, they are even easier to make in the Instant Pot electric pressure cooker. Just say no to waiting for a pot to boil and then having to drain that hot water out. No more soggy potatoes! This is a simple recipe for basic mashed potatoes. No garlic or cheese in it, as I wanted to share the basic recipe that would be good smothered in gravy, loaded with extra butter or sour cream, and any toppings you like. 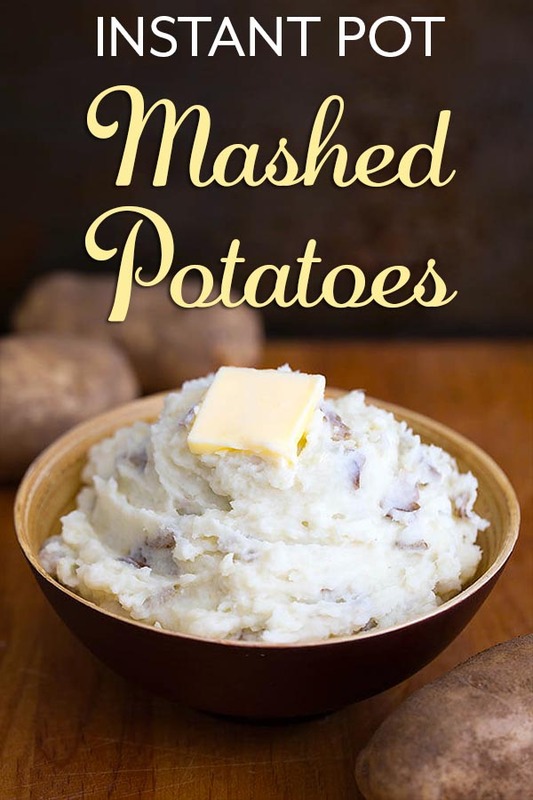 I think this mashed potato recipe satisfies the ‘mashed potato purists’ out there. 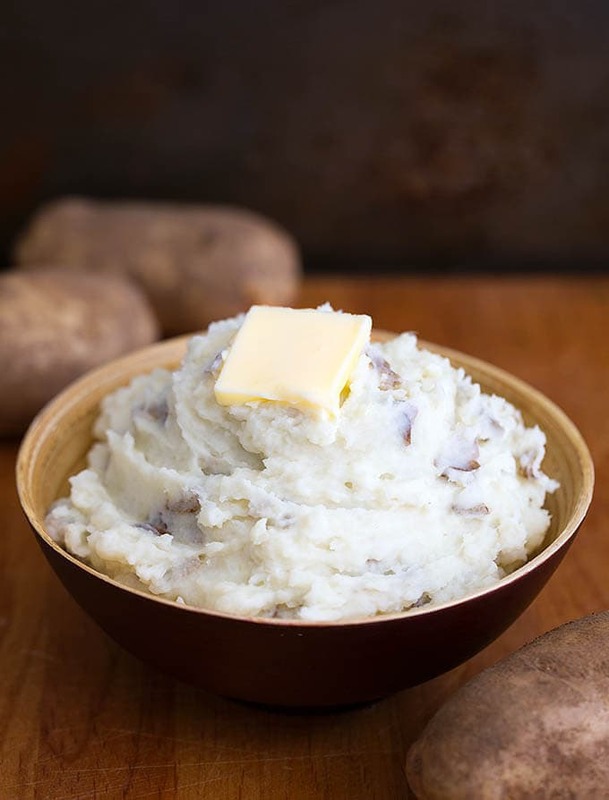 Though I have nothing against garlic mashed potatoes, you can find that recipe here: Instant Pot Creamy Mashed Potatoes. It starts with the right potato. Most people know that Russets are the premium baking potato. They’re high starch and low water. That’s important because the starch is going to absorb that water and swell up. When you cook the potato, it gives the crumbly, plumpy texture that we think of as “fluffy.” Start with the Russet. Russets come out pretty nice, but use what you have. I also like Yukon Gold Potatoes. Something about the creamy texture is very appealing in mashed potatoes. Speaking of peeling (haha), I don’t peel my potatoes, I just mash that peel right in with the potatoes. Go ahead and peel yours if you like them that way, there is no wrong way to enjoy them! 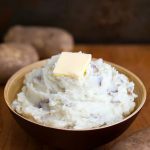 Instant Pot Mashed potatoes are very easy to make. It doesn't take long to cook fluffy pressure cooker Mashed Potatoes using this easy recipe. Put the water into the inner liner of the Instant Pot. Scrub the potatoes, or peel them, if you prefer. Cut each potato into fourths. Put the potatoes in a steamer basket or steamer rack. Set the basket or rack into the pot. Close the lid and lock it into position. Set the Steam Release Knob to the Sealing position. Set to Pressure Cook (Manual), and use the +/- button or dial to choose 8 minutes. When the cook cycle ends, do a Quick Release of the pressure by turning the steam release knob to Venting (on the Ultra, just press the steam release button). When all of the steam is out and the pin in the lid drops, open the lid and remove the basket or rack of potatoes (very carefully) and transfer potatoes to a bowl. Add the butter and use a potato masher to incorporate the butter as well as mash the potatoes. Try not to over mash them. Add the salt and cream, then use a spoon to continue mixing to the desired consistency. Add more cream or milk as desired. How many pounds of potatoes do you think that I can cook in an 8qt? Would I have to adjust the cooking time? It depends on the size of the potatoes. I have loaded up my pot to just below the max fill line and only added a few minutes because the potatoes were a little bigger than what I normally cook. Pressure cooking times are affected by the thickness / density of the food you are cooking. So if the pieces are all about the same size, like a medium potato cut in fourths, you shouldn’t have to add any time. If your potatoes are big and you cut them in fourths, add 2 minutes. Hi Crystal, you can put in as many as will fit in the pot. Load it up, but don’t go past the Max fill line. Do u sstill do the videos on you tube. I just discovered you and love watching u make the recipes and explain thing with the instant pot. I noticed there were not many recipes a d then I found you on Facebook with later dated recipes. I hope you show the videos again!! Hi Denise! I’m working on some new ones. I had to find a phone that is better to make videos with! Stay tuned! If I double the mashed potato recipe do I need to increase the amount of water? I thought I read somewhere that is not necessary in the IP but just wanted to double check. I would not add extra water.